Hjem » Sol & Solarium » Solariumskrem flasker » Go To Black Double Dark Bronzer 350 ml. 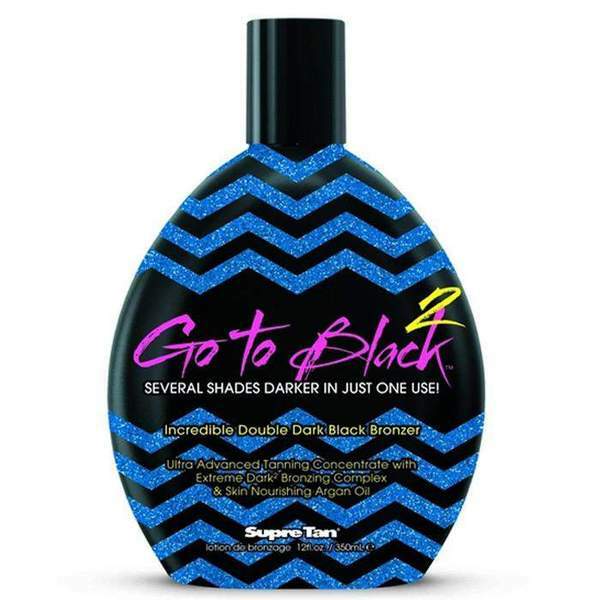 Go To Black Double Dark Bronzer is the next generation of instant tanning gratification delivering extremely dark color in the snap of a finger. This Incredible Double Dark Black Bronzer combines the tanning concentrate of Tyrosine and Carrot Oil with Extreme Dark2 Bronzers to take your dark tan to the next level in just one tanning session. As skin nourishing Argan Oil leaves you feeling miraculously silky and smooth, be prepared to reach a new standard of darkness. Extreme Dark² Bronzing Complex combines powerful DHA and natural bronzers that continue to dramatically darken skin up to 12 hours after UV exposure and last up to 8 days. Vitamins A, C & E help reduce the appearance of fine lines and wrinkles for a more youthful appearance. Once you experience the dark power of Go to Black you’ll never go back... Trust us!